Southend moved into the League Two automatic promotion places after an error from Luton goalkeeper Elliot Justham gifted them victory. After a first-half of few chances, Shrimpers' Ben Coker was sent off for a foul on Shaun Walley after the break. 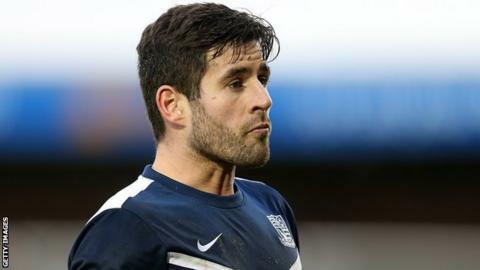 But Michael Timlin's 25-yard strike was not held by Justham and the ball rolled into the net to give Southend the win. The result means Phil Brown's side will be promoted if they beat Morecambe in their final league fixture. Luton meanwhile are three points behind Plymouth Argyle in the final play-off spot and have a significantly worse goal difference. "I thought we were strong and I thought we looked organised. We had three or four glorious opportunities that just wouldn't go through for us. "Our form of late has been very good. I'm not going to just look at today, I'm going to look at all season and I think we've done terrific. "We're still going to have a go at it on Saturday. Absolutely 100%. It was unlikely that Elliot would make that mistake today so who knows about unlikely?" Match ends, Southend United 1, Luton Town 0. Second Half ends, Southend United 1, Luton Town 0. Attempt missed. Shaun Whalley (Luton Town) right footed shot from outside the box is just a bit too high from a direct free kick. Alex Wall (Luton Town) wins a free kick in the attacking half. Myles Weston (Southend United) wins a free kick on the left wing. Corner, Luton Town. Conceded by Adam Barrett. Substitution, Luton Town. Alex Wall replaces Scott Griffiths. Corner, Luton Town. Conceded by Daniel Bentley. Attempt saved. Scott Griffiths (Luton Town) right footed shot from the centre of the box is saved in the top right corner. Goal! Southend United 1, Luton Town 0. Michael Timlin (Southend United) right footed shot from outside the box to the centre of the goal. Attempt saved. Shaun Whalley (Luton Town) left footed shot from the right side of the box is saved in the top right corner. Attempt saved. Adam Barrett (Southend United) left footed shot from outside the box is saved in the centre of the goal. Michael Timlin (Southend United) wins a free kick on the right wing. Attempt saved. Barry Corr (Southend United) right footed shot from outside the box is saved in the bottom right corner. Attempt missed. Shaun Whalley (Luton Town) left footed shot from the centre of the box misses to the left. Corner, Luton Town. Conceded by Ryan Leonard. Gary Deegan (Southend United) is shown the yellow card. Substitution, Southend United. Luke Prosser replaces Will Atkinson. Corner, Luton Town. Conceded by Cian Bolger. Ben Coker (Southend United) is shown the red card for a bad foul. Substitution, Luton Town. Luke Guttridge replaces Elliot Lee.